Sherry Bowman is a native Clevelander who graduated from South High School in 1978. She continued her education at Tennessee State University and Cleveland State University. Sherry developed a keen interested in politics early in her life when her father, Edward Bowman, worked on the campaign staff of then City Council candidate George L. Forbes. Through a chance encounter with the late City Council member Lonnie L. Burten, Sherry was provided with the conviction of helping people, of not being afraid to speak her mind and finally, the lesson of doing good instead of looking good. Through her friendship with the late Councilman Burten , she met a young law student named Frank G. Jackson. In 1995, Sherry joined The Eight Ball Club of Cleveland, Ohio, an African-American social service organization dedicated to the prevention of domestic violence. During this period, her interest in social justice developed. She organized a weekend event commemorating the Eight Ball Club 20th Anniversary for which the price of admission was a donation to the West Side Catholic Center. Sherry left the Eight Ball Club in the Fall of 2007 to establish Feelgoode.com, an all - access website for the African-American LGBT community, which she felt was needed after noticing that there was an “information void” regarding LGBT issue’s that affected her community. Through her work with Feelgoode.com Sherry has become a member of the NAACP, Cleveland Stonewall Democrats, Equality Ohio, Cleveland Families Count and most recently the Cleveland Human Rights Committee. Sherry later noticed that there was no single organization which focused on building unity within the African-American LGBT community. So. With the help of some friends, Movement in Black was formed. The mission of Movement in Black is raise the political, social and cultural inclusion and visibility of the community of color in Northeastern Ohio. Presently, Sherry is involved with the fight for full Equality for everyone. She recently spoke at the rally for Equality and Marriage Equality held in Cleveland, Ohio. 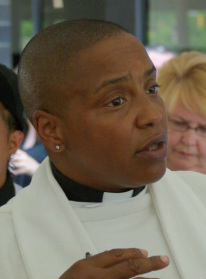 I was ordained in February 2012 at the AFC, I also have a pending ordination with the Progressive Christian Alliance, I will start the seminary in fall 2012 and I am the Founder of LGBT Ministries of Cleveland. I love the Lord with all my heart. I am married to Terry Moore, who is the Executive Assistant of LGBT Ministries of Cleveland. We have three adult children and three grandchildren. LGBT Ministries of Cleveland was founded to re-affirm and to continue to affirm the LGBT communities rite of passage to God's table, to assure you that God loves you and to prove to you that there is nothing in the New Testament that sends you to a burning hell because of who you chose to love. The more I'm at this ministry, the more I meet young people who are atheist. I highly suspect that is because of the poor representation of Christ and the mere fact that there just aren't enough ministers willing to go into the world and debate this with the "Christians", who have been dictating, instead of teaching Gods' Holy word. I want to be the voice in your ear that says, why would you prefer to listen to the people who say God doesn't love you instead those of us who say He does? I want you to continue to hear me say that "a text without context is pretext". You wouldn't accept one paragraph from each chapter of any other book now would you? Perriline Houser is a Cleveland native and educated in Cleveland, OH. Best known as Perri, a longtime member of the LGBT community. Blessed with a soul mate of 39 yrs, two grown sons. A family oriented individual, who shares her life experiences and gems of expertise for all who are willing to listen. Began my professional career at Western Reserve Research Center in the Fall of 1962, as a secretary, then researcher. Then onto working as a computer programmer at Western Reserve until being widowed at a young age in 1969. Drove a school bus for the Beachwood School system, 1973-1982. Opened a small party facility, restaurant and catering business, 1979-1988. Mastered multiple technical skills in carpentry, drywall, painting, minor electric and plumbing. A Licensed General Contractor in rehab/remodeling for 17 yrs, prolific in putting contracts and plans together for community projects and my own investment properties. In 1986 worked as a driver for Beech Brook, (a mental health treatment facility), fall of 1989, appointed as Director of Transportation. Primary responsibilities included scheduling personnel for a seven day week program period, including all holidays, along with scheduled maintenance for all agency owned vehicles. Working in this environment, I became certified as a Mental Health Worker, retiring in April 2002, on disability. Working part time eves, from 1998 until March 2000, worked for Children's Community Access Program in East Cleveland in the Respite Program, then acting as Interim Group Home Manager for one year. A consistent contributor to the American Cancer Society, St Vincent DePaul and many LGBT events. Donator of clothes, shoes and furniture to the homeless community. Affiliated with Social Groups within the LGBT community and others outside. Have participated in Rainbow Connection, The Genuine Six in our community of color in Cleveland, and a member of Club Nu Era. I have been the Office Manger and Executive Assistant at Family Connections of Northeast Ohio since since 2003. I am the Executive Assistant at LGBT Ministries of Cleveland which was founded by my "Hersband", Detra Evans. Prior to joining the Parent Center, I held various management positions with Restaurant Associates. I was employed at Key Bank for 18 years as an Administrative Assistant, belonged to Toast Masters and was a part of The Professional Secretaries organization. We have 3 adult children, and are the proud grandparents of Jordyn, Jalen & Jacob. Born in Cleveland, Ohio. Raised in the Hough area where I currently reside in our family home. Educated in Cleveland Public Schools – Wade Park Elementary, Addison Jr. High and East High Schools. Earned the Bachelor’s Degree in Business with major in Accounting from Cleveland State University in 1983. Master’s Degree was earned at Keller School of Management (DeVry University). Graduated in 2005 with a Master’s in Business Administration. Over 25 years of accounting professional experience in various areas of business – Non profit and profit; Worked in the Arts, trucking and transportation, community development and currently commercial real estate. Operated my own tax preparation business for almost 30 years. LGBT Community Activities: In 1989 became a part of the LGBT community. 1991-1994 formed AJ Productions with two friends. AJP sponsored social activities for the LGBT community at large. We held annual picnics, bowling parties and other events. We even put together our own newsletter. 1992 – 1998 – participated in the Womyn’s Variety Show as a part of the Sound crew. 2000 – Present. Participated in various LGBT organizations. 2005 – Present . A founder of PuNane. A group of women working together to showcase African American lesbian culture in Cleveland. The 6th Annual Talent Showcase was recently held in May 2011. 2007 – Present . Cleveland Black Pride. Have been very active in this organization since joining. Our annual celebration is August 5 – 7, 2011. Our signature event is the White Fantasia on Saturday and the Family Picnic held on Sunday. This weekend of events usually draws over 1000 participants from the African American LGBT community. In 2010, I presented the idea of being a part of the 2014 Gay Games to be held in Cleveland to four of my closest associates/friends and after many discussions around the dining room table, Movement in Black was born.